Microsoft chief executive Satya Nadella outlined his new vision for productivity Wednesday in front of thousands of the company’s partners, pledging to make the Microsoft ecosystem as pervasive as possible. At the Worldwide Partner Conference in Washington, D.C., Nadella and other Microsoft executives offered few updates on the company’s direction, reiterating plans they’d announced before and recapping several products the company had shown previously. There were a few exceptions: Tony Prophet, the corporate vice president of Windows marketing, held up an unnamed, Intel-powered, 8-inch Windows tablet from Toshiba that he said would be priced competitively with eight-inch Android tablets. Prophet also showed off a screenshot of the upcoming revamped Windows Start menu due in the next version of Windows, along with Modern or Metro apps that can run in windowed mode on the desktop. Nadella highlighted Project Siena, a beta app to let non-developers quickly create basic apps on the fly for mobile devices. 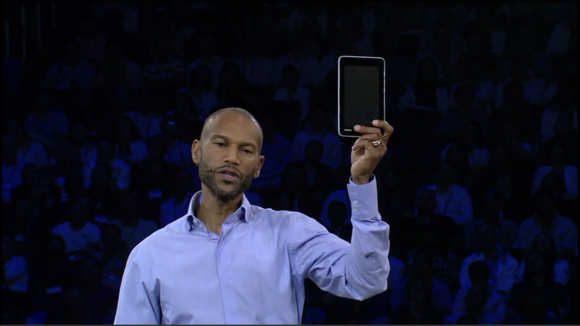 Microsoft’s Tony Prophet holds an unnamed 8-inch Windows tablet from Toshiba. 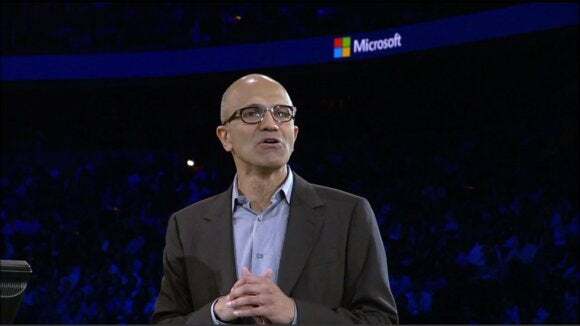 In general, however, Nadella elaborated on the strategy memo he issued last week: that Microsoft was the productivity and platform company for the mobile-first and cloud-first world, and what that would mean to its partners. Nadella spoke eloquently and persuasively about his vision for Microsoft, appearing at times more politician than architect. “We are the company, we are the ecosystem that can harmonize the various intents of individuals, IT and developers, bringing them together so that we can achieve more and do more,” he said. ThyssenKrupp taps into real-time sensors inside its elevators, as well as Microsoft’s machine-learning capabilities, to figure out when its elevators could fail and take action before they do. On the other hand, Nadella also faces the unenviable task of taking a company built on selling discrete products like Word, Vizio, Outlook, and Azure, and tying them together into a services ecosystem more like Google’s. “When it comes to digital work and life experiences, the thing that we are going to do is start by building great experiences individually—that means we are going to have fantastic email, great file sharing, great communication and collaboration” with products like Skype, Outlook, and OneDrive, he said. But Nadella said it wasn’t about those products—or, as he referred to them, as the “application silos.” Rather, Microsoft’s goal is to tie them together better. “We are building out that digital infrastructure that ties together people, their activities, their relationships, to all of their artifacts of their life, whether that be photos or documents, at home or at work,” Nadella said. Microsoft’s products are being rearchitected for this new reality. Earlier, Nick Hedderman, a group marketing manager at Microsoft, showed how quickly corporate apps and policies could be pushed to a user’s personal Windows Phone—and how quickly they could be removed if the user left the company. Prophet, meanwhile, talked up Microsoft’s new universal apps, where developers can “code once” using common APIs for Windows devices, from smartphones to PCs to Microsoft’s gigantic Perceptive Pixel displays. 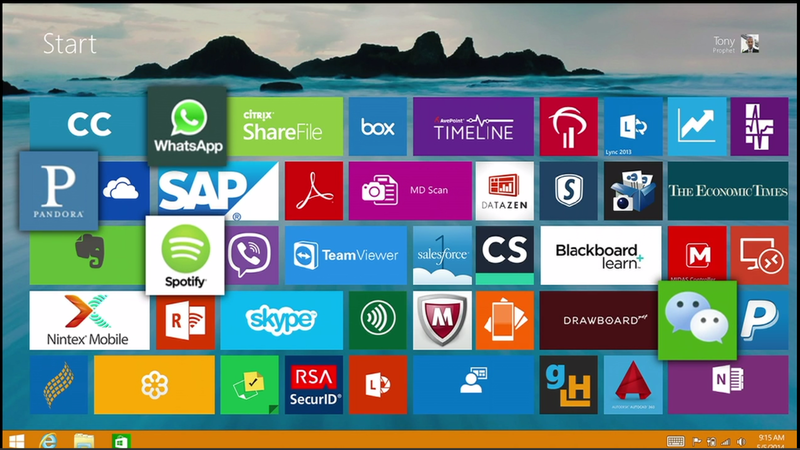 Some of the productivity apps for the Windows platform. Where is Windows in all this? The goal for Windows is to take those “digital work-life experiences and make them shine,” Nadella said. Windows will have “consumptive experiences” like Pandora, he said, but the real goal of Microsoft and its hardware and software partners is to emphasize productivity. Office 365, the company’s flagship productivity suite, will be the focal platform for developers to build upon, he said. “Any organization that wants to thrive in a world of data needs to provide a culture of data,” Nadella said. Project Siena: a beta app where non-developers can quickly create apps on the fly. To pull it all together, Nadella showed off a few applications that he said represented the direction in which Microsoft is heading: a real-time worldwide monitoring dashboard of elevators manufactured by ThyssenKrupp Elevator Americas, the Siena app, and another demonstration of the Skype real-time translator that Microsoft had shown off previously. 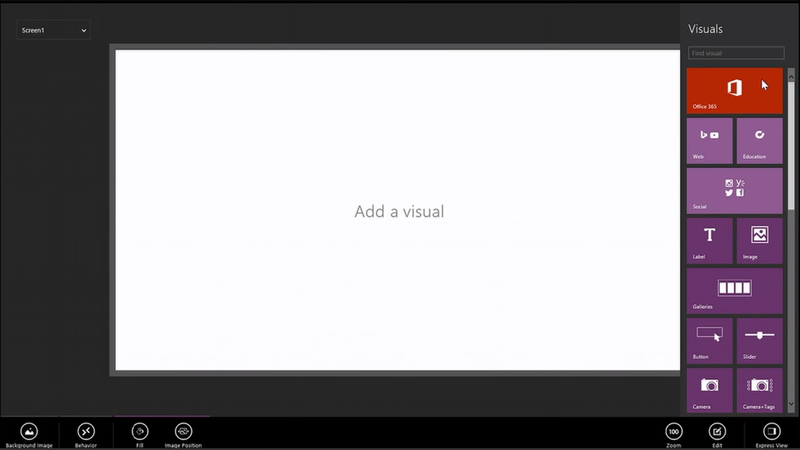 The Skype translator may be in preview by the end of 2014, Nadella said. 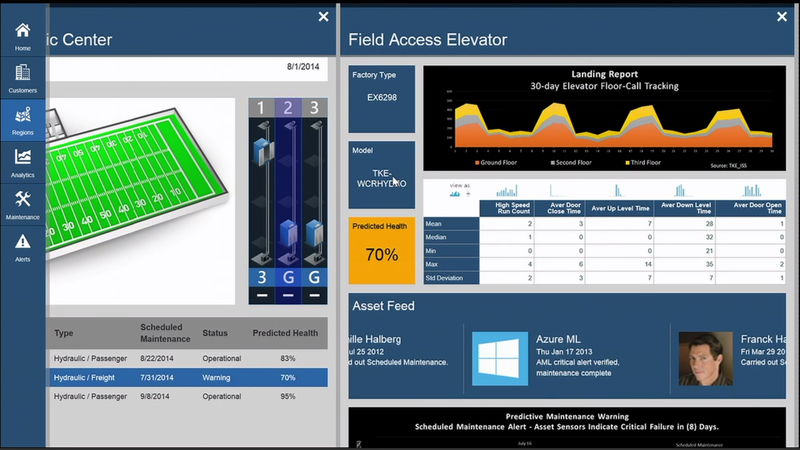 The ThyssenKrupp app used Microsoft’s machine learning to sift through maintenance records and performance logs inside the connected elevators to predict when an elevator could fail. Microsoft chief storyteller Steve Clayton whipped through the Siena demonstration to show how apps could be created on the fly. The idea, as Nadella implied, was that many users are already coding and don’t even know it. “If you can build an Excel spreadsheet you can can build this app,” he said of Siena. In February, Nadella was named chief executive of Microsoft. He’s now had one full quarter to settle in. Next week, on July 22, Microsoft reports its quarterly results, where we’ll see the first hint of how Nadella’s new strategy is playing out.